Hear how Britain's number 1 female skier started her journey to becoming one of the worlds best. Just before the Courchevel World Cup last winter we were lucky enough to catch up with Alex Tilley, World Number 37 and Britain’s top ranked Slalom and Giant Slalom skier. 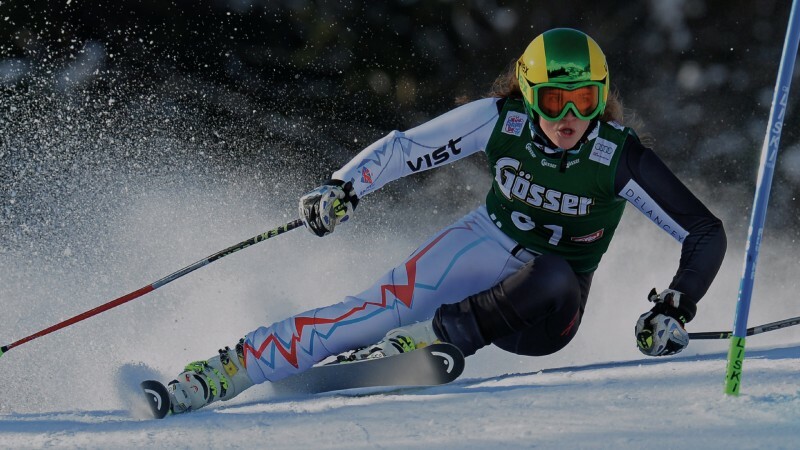 With huge focus on our winter athletes in the build up to the Pyongchang Olympics in just a few months, we wanted to know more about the start of Alex’s journey to being one of the Worlds fastest ski racers. Whether you want your children to become world champion ski racers or just want your children to enjoy the family ski holidays, having the right instructor at the beggining can make all the difference. MS: How old where you when you learnt to ski? Alex: I learnt to ski when I was 7 almost 8, at a dry slope near me. I was talked into it by my next door neighbour, I used to watch people play football and skateboard and thought skiing would be cool sport to get into, I had tried a few different sports but had never stuck with any of them so there was a lot of encouragement when I enjoyed the skiing. MS: Where was the dry slope? Alex: Alford dry slope, it’s quite short and I don’t think you could fit more than 9 slalom poles on it, but it was great. MS: Do you remember your first ski instructor? Alex: I do, yeh I remember her name was Marie, I remember turning up to my first lessons in a one-piece ski suit and being completely in the dark with what I was getting myself into, but she took me under her wing and was really supportive and comforting, I had a great time. MS: Do you see her as a big reason you got into the sport? Alex: Absolutely, if I had turned up to the first few sessions and hadn’t enjoyed it then that would have been it, but because she gripped me from the beginning, I loved it from the word go. So yeh she’s definitely one of the reason’s why I still do it now. MS: Are there any outstanding memories you have from those early days? Alex: We were on a family holiday in Andorra, and I remember those first days on snow and being able to explore the mountain and thinking “this is just awesome”. MS: What would you recommend to any parent wanting to get their children skiing? Alex: I definitely think it’s good to start with professional lessons, it’s a big one. I’ve seen a lot of parents trying to do the job themselves and struggling, I don’t think its particularly enjoyable for the kids. I’m grateful that my parents took me to have lessons, getting the basics sorted first. MS: How can having the right coach or instructor make a difference? Alex: Coaches and Instructors are all different in how they coach/teach, so suit different people, I guess it’s a compatibility thing, you have to have that mutual understanding. I just think if you do understand each other you will enjoy the sessions far more and also improve quicker. MS: What influences would you say coaches have had on your career? Alex: Hate to give them credit… (she laughs), every coach I’ve had has always taught me something new, something I can take forward with me, even if that’s just enjoyment in the sport its self. My current coaching team have definitely stepped up my professionalism and consistency, and are helping me take that step to the next level. MS: Where is your favourite place to ski? Alex: Oh that’s a tough one, I always love going to America, Beaver Creek is a great ski area. We don’t often get the chance to ski the whole mountain but that clearly stands out as one of my best days. MS: Did you have any role models growing up? Alex: Alain Baxter was one of my early idols, when he won his medal at the Salt Lake Olympics, I had just starting skiing. I remember my dad going crazy at the T.V., celebrating, but I didn’t understand what he had achieved, only in the past 5 years or so have I realised, I’m always a little bit gutted I didn’t have that understanding at the time. And the other of course is Chemmy Alcott, as a female skier on the World Cup circuit and a great role model. MS: What has skiing given you that you wouldn’t have had otherwise? Alex: I left school very early at 16, I went straight from school to being a full time ski racer and grew up very quickly, learning to live by yourself, cooking etc. When I look back I realise I took on quite a lot at a young age. My favourite part of the lifestyle is definitely the traveling, I open my passport now and I have stamps from Japan, New Zealand, America, it’s a huge opportunity and I’m very grateful for it too. Make sure you follow Alex this winter on the WC circuit, either on Eurosport or on Ski Sunday. Maison Sport allows you to choose your ski or snowboard instructor using real reviews from previous customers experiences. It is often cheaper than other ski schools. We currently operate across more than 60 resorts in France.